St Edmund was king of East Anglia from about 855 until his death. Almost nothing is known of Edmund. He is thought to be of East Anglian origin and was first mentioned in an annal of the Anglo-Saxon Chronicle, written some years after his death. His kingdom was devastated by the Vikings, who destroyed any contemporary evidence of his reign. Later writers produced fictitious accounts of his life, asserting that he was born in 841, the son of Æthelweard, an obscure East Anglian king, whom it was said he succeeded when he was fourteen (or alternatively that he was the youngest son of a Germanic king named ‘Alcmund’). Later versions of his life relate that he was crowned on 25 December 855 at Burna, an unidentified location, and that he became a model king. In 869, the Great Heathen Army advanced on East Anglia and killed Edmund. He may have been slain by the Danes in battle, but by tradition he met his death at an unidentified place known as Haegelisdun, after he refused the Danes’ demand that he renounce Christ: the Danes beat him, shot him with arrows and then beheaded him, on the orders of Ivar the Boneless and his brother Ubbe Ragnarsson. According to one legend, his head was then thrown into the forest, but was found safe by searchers after following the cries of a wolf that was calling, “Hic, Hic, Hic” – “Here, Here, Here”. Commentators have noted how Edmund’s death bears resemblance to the fate suffered by St Sebastian, St Denis and St Mary of Egypt. A coinage commemorating Edmund was minted from around the time East Anglia was absorbed by the kingdom of Wessex and a popular cult emerged. In about 986, Abbo of Fleury wrote of his life and martyrdom. The saint’s remains were temporarily moved from Bury to London for safekeeping in 1010. His shrine was visited by many kings, including Canute, who was responsible for rebuilding the abbey: the stone church was rebuilt again in 1095. During the Middle Ages, when Edmund was regarded as the patron saint of England, Bury and its magnificent abbey grew wealthy, but during the Dissolution of the Monasteries, his shrine was destroyed. The mediaeval manuscripts and other works of art relating to Edmund that have survived include Abbo’s Passio Santi Eadmundi, John Lydgate’s 14th century Life, the Wilton Diptych and a number of church wall paintings. 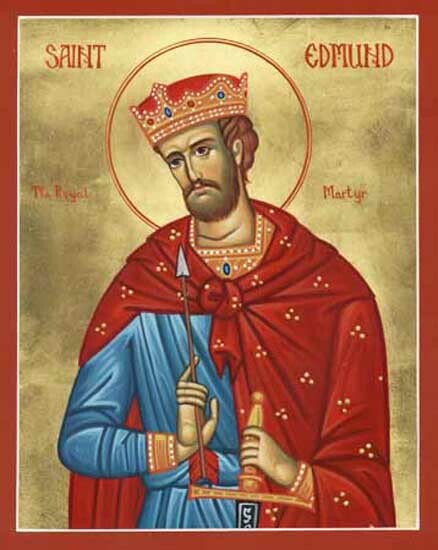 O God, whose mercy is beyond all telling, and who didst give the blessed King Edmund strength to overcome his enemy by dying for Thy sake, in Thy loving kindness grant that by his intercession we, Thy servants, may have grace to conquer and extinguish in ourselves the promptings of our ancient foe. Through our Lord Jesus Christ, Thy Son, Who with Thee liveth and reigneth in the unity of the Holy Ghost, God, world without end. Look graciously, we pray Thee, almighty God, upon this redeeming sacrifice, and at the intercession of Thy blessed martyr King Edmund, accept it as a peace-offering on behalf of Thy servants here. Through our Lord Jesus Christ Thy Son our Lord, Who liveth and reigneth with Thee in the unity of the Holy Ghost, one God Forever and ever. COMMUNION ANTIPHON Matthew 21. 24. May the tribute of our homage be pleasing to Thee, almighty God; and, at the intercession of Thy blessed martyr King Edmund, may this sacrament which we have taken help us to lay hold of the rewards of everlasting life. Through the Lord Jesus Christ, Thy Son, Who liveth and reigneth with Thee in the unity of the Holy Ghost, one God For ever and ever.